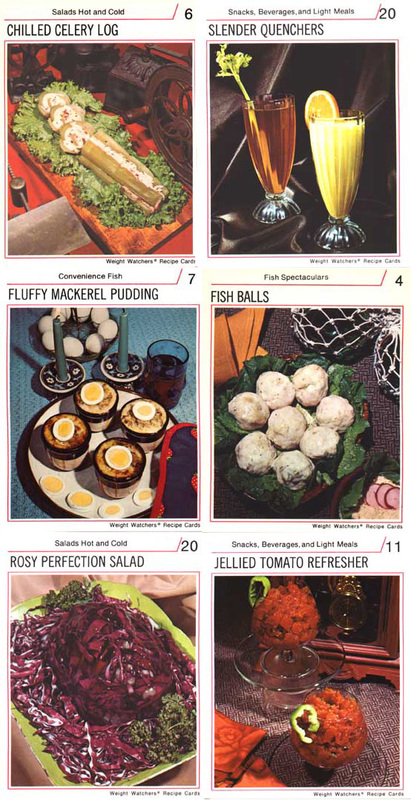 These are just a handful of 1970's Weight Watchers recipe cards, as seen on Candyboots.com. Perhaps trends have changed in the last 30 years or nutritional ideas redefined, but for me the thought of eating any kind of log or jellied food would scare the weight right off of me. I think some people call it starvation. The remaining cards in the collection are definitely worth a look, accompanying commentary included. It's clear that this diet program was concurrent with the age of disco biscuits and nose candy. Lucid thoughts were not necessarily flowing over. Thanks again Bannister for another gem!